Originating from Birmingham, England, QUARTZ date back to 1974, and were considered to be at the forefront of the New Wave Of British Heavy Metal. They released their first album on Jet Records in 1977, which was produced by BLACK SABBATH’s Tony Iommi. Around 1983, Malcolm Cope also joined the roll call of QUARTZ members being called up to BLACK SABBATH working on pre-production demos for the “Born Again” album. Incidentally in 1980 Malcolm was approached by Ozzy Osbourne to join his solo band but he declined, stating that QUARTZ was his band. On January 31, 2015, Skol Records released “Too Hot To Handle” CD, which can be considered as a complete unreleased album from back in the day, as it’s a collection of 16 previously unreleased songs recorded between 1981 and 1982. Some of those tracks were re-recorded in different versions for the “Against All Odds” album (1983), and some of them see the light of the day for the first time ever. 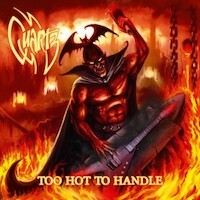 Because of the band’s connection with legendary BLACK SABBATH, the new album “Too Hot To Handle” is a part of the heavy metal history. QUARTZ are big on melody, the entire album revolves around harmony, sharp riffs, clean vocals, several catchy hooks and a haunting rock groove. The opening track of the album “Too Hot To Handle” starts very slowly, with melodic riffs, typical ‘80s style, followed by a precise guitar solo and David’s warm voice. “Crack The Sky”, is a romantic ballad that builds up to the end with some powerful roaring vocals. The beginning of “Hard Road” has a mushy guitar sound, completely unintelligible and a David Garner desperately trying to cover the instruments. The ending has a good solo, in my opinion, the only good part of the entire melody. Might be just me, but “Just Another Man” chorus sounds somewhat like IRON MAIDEN’s “Seventh Son of a Seventh Son”. Continuing with #5, “Silver Wheels” we have some atmospheric rhythmic guitars powered by some great instrumentalists and a catchy refrain, it would have been definitely a hit back in the days. With “Hell Livin’ Without You” I had a terrible deja vu, the heaviness groove made me think of early UFO. The music sounds old, it’s so typical ‘80s, the type that my father listened to on his old record player. If “Too Hot To Handle” would have been released back in the day, I have no doubt that it would have been a hit, unfortunately, not a timeless one. Don’t get me wrong, the album is worth your time, but I have my doubts whether or not young people will get ‘addicted’ to it.